They are very slender birds with long legs and neck. They have a very characteristic peak. 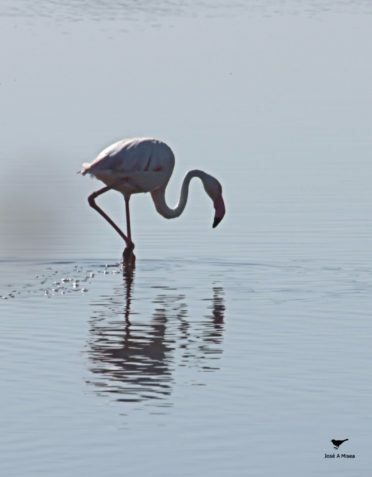 All species are pink, in particular, European flamingo is almost clear pink. These birds, whent they fly, keep the neck and legs streched out. These animals need large expanses of shallow water, usually saline. Their nests are of clay and they put one or two eggs that incubate during 30 days. They feed on crustaceans and algae. We can find this species in the Natural Park of the Bay of Cádiz that includes the municipalities of Cádiz, San Fernando, Chiclana, Puerto Real and Puerto de Santa María. Our apartments are very close to these municipalities so you can visit them to meet this kind of curiosity bird.